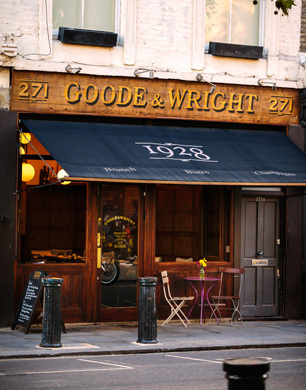 Perched on Portobello Road and right opposite Portobello Square, Goode & Wright is a Classic French Bistro offering a little piece of Paris in London’s trendy Notting Hill. StyleNest recently popped in to this Parisian hideaway to put their revered brasserie fare to the test. Stepping into Goode & Wright, we immediately soaked up the French Bistro atmosphere of this 40-seater wood panelled dining room with chequered floors and classic-style furnishings. With its comfortable and unpretentious décor, it’s like escaping the bustling London streets and stepping into a nostalgic brasserie somewhere in Europe. A Tuesday evening and the place is slowly filling up with locals, couples, business men and even single diners enjoying their wine and small plates with a book, all enjoying the peaceful, informal and charming atmosphere. We are warmly greeted by a friendly waitress who shows us to our table and talks through their menu. To our amazement, the menu changes each and every single day with each dish being inspired by seasonal ingredients and fresh British produce available. There’s a choice of small dishes to choose from, either as a starter or as a combination of sharing plates, then there’s a selection of larger plates for main course, a list of indulgent desserts, creative cocktails and the wine list (even the wine list changes daily). The menu boasts generous and gutsy brasserie fare where seasonal dishes include the likes of Confit of Parsnip with Roquefort and Sage, Duck Egg in a Basket with Chorizo, Roasted Marrow Bones on Toasted Sourdough and Triple Cooked Chips with a luxurious and velvety Truffle Mayonnaise, all very reasonably priced at around £5 – £7 for a small plate (starter or sharing dish), £15 – £20 for a large plate (main course portion), and £3 for sides. Whilst we pondered over the enticing menu, we were brought our pinot noir (in a carafe – the perfect amount to share on a week night), a little plate of French bread with spiced butter and a carafe of water. We decided on a selection of small plates to share; the devon crab with chicharron and avocado which was beautifully flavoursome and light, the salt baked beetroot with nori seaweed and goats cheese which was the perfect balance of saltiness and creaminess, and the salt baked roecoff onion with Nduja and taleggio cheese. Moving on to main course, I had the sirloin steak (which came beautifully pink and garnished with fresh herbs) with triple cooked chips and truffle mayonnaise, whilst my partner enjoyed the highly recommended buttermilk chicken schnitzel with avocado and lemon. After dinner we perused the bold and daring cocktail menu devised by the innovative Matt Whiley of Talented Mr. Fox, with carefully crafted cocktail combinations including “4466 Miles from Delhi” which is made of Peanut butter, gin, acid, coconut water and curry leaf. For dessert we shared the salted caramel ice cream with bits of heavenly honeycomb, whilst our fresh peppermint tea arrived in charming individual tea-for-one teapots from the Rare Tea Company. With so much relaxed and understated charm combined with enticing yet affordable meals, there’s something very good and very right about Goode & Wright.